YANGON – Despite a number of European countries continuing to discourage travel to Myanmar based on allegations against the army of committing crimes against the Rohingya community in August 2017, the government of the Netherlands has eased its stance on one Rakhine State tourist destination last week. 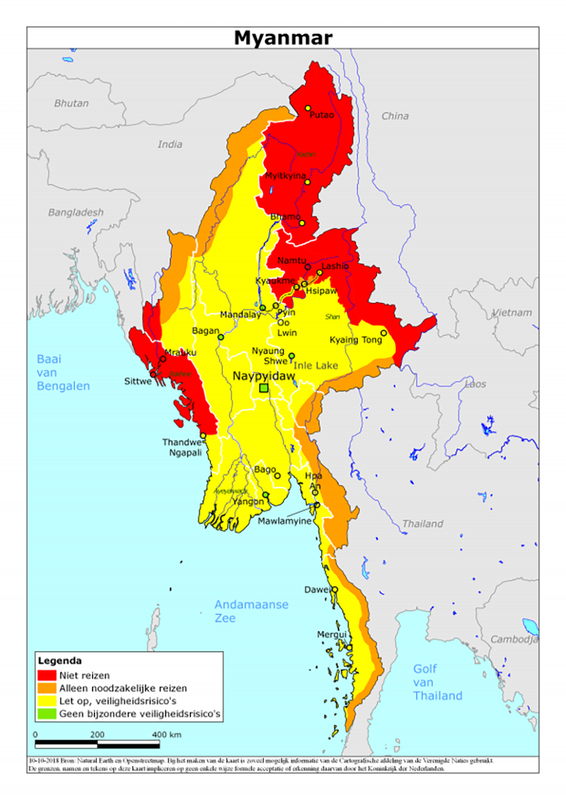 Last year, on the official map outlining areas of Myanmar considered safe and unsafe to travel to, the Netherlands marked the entire Rakhine State in red, marking it as an unsuitable state to visit due to instances of violent conflict there, particularly referring to northern Rakhine State from where nearly 700,000 Rohingya fled from military rampages and sought refuge in neighboring Bangladesh. The official website of the Netherland’s Foreign Affairs Ministry “The Netherlands Worldwide” —published in Dutch— updated its map on Oct. 10 to mark the areas of Kachin State, northern Shan State and the majority of Rakhine State to a red status. The website advises tourists traveling to Ngapali Beach to follow the “messages in the media” and to inform a travel company, hotel and local authorities in advance of their trip. Some Myanmar travel agencies and hoteliers have welcomed the Dutch authorities’ update to the map. However, there have been some points of criticism towards the update as some key tourism areas still remain in the red zone. Specifically, northern Rakhine’s famous archeological site, the ancient city of Mrauk-U where a large number of pagodas, temples and stupas still exist, spurring archeologists and the ministry of religious affairs to apply for UNESCO World Heritage Site status for the site in 2019 in still under red status. It’s unclear how many western governments rank Myanmar as an unsafe country for holidaymakers on their official travel advice websites. Daw Yin Myo Su, owner of Mrauk-U Princess Hotel near the ancient city site assumes two possible factors for Mrauk-U remaining in the red zone on the Dutch travel warning map: there could be barriers for travelers in applying for travel insurance if they intend to travel to the area, and there could be a lack of proper information about the on-the-ground safety status via the respective foreign embassies. “[Changing the status of] southern Rakhine’s Ngapali is better than nothing for [the tourism sector]. We are glad to hear that either way,” she said. She explained that Mrauk-U should not be recognized as a conflict-sensitive area as it located one hundred miles from the conflict-torn Maungdaw Township and doesn’t even have an internally displaced persons camps like the state capital of Sittwe and Thandwe Township. She had expected wider travel relaxations from western countries and urged for travelers to be provided with more accurate information. Managing director of travel agency Nature Dream Daw Sabe Aung, said she was confused about the selective destination ranking by the Dutch government and questions whether the change is linked to interests in foreign investment in Ngapali or whether the ranking is based on complaints from travelers to who want to visit Ngapali. “Is that because of foreign investors in Ngapali? As far as I know, there is no foreign-owned hotel business in the Mrauk-U tourism industry,” said Daw Sabe Aung. In her work as MD of one of the top travel agencies in Myanmar, Daw Sabe Aung noticed that many Russians, Germans and some other westerners have travelled to northern Rakhine’s Mrauk-U recently. She added that some of them even went to Chin villages located in rural areas outside the town of Mrauk-U to see the women with traditional facial tattoos.